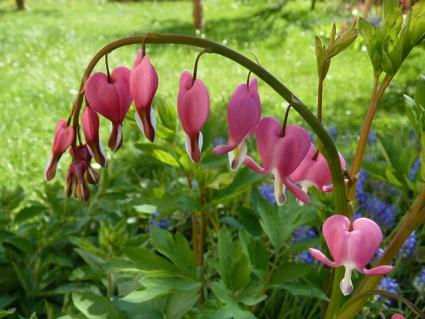 Bleeding hearts are elegant forest plants that make a charming addition to any shade garden. They have a few particular needs and maintenance requirements, however, so it's important to learn how to grow them successfully and avoid some of the common pitfalls. 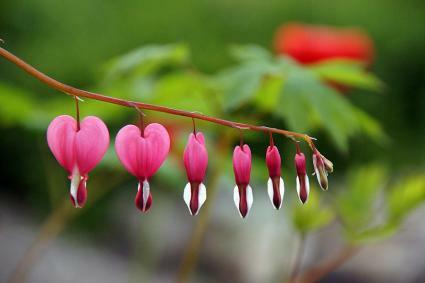 Bleeding hearts have a bit of a dainty appearance with gracefully arching stems and fine ferny foliage that is easily damaged. The flowers are small but spectacular and are clearly the inspiration for the name: they are heart-shaped, typically red or pink, and are split open at the bottom. The plants are perennials that spread by underground rhizomes to form loose colonies where conditions are optimal, but they are not particularly invasive. The light-colored bluish-green foliage ranges from six to 24 inches in height depending on the variety with the flowers rising slightly above the leaves. They are dormant in winter. Pink and red forms tinged with white are most common, but there is also a pure white type known as Alba and a yellow-leafed variety called Gold Heart. 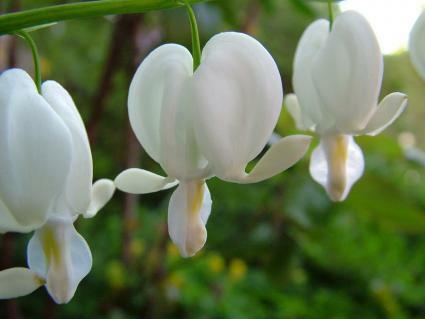 Plant bleeding heart in the cool weather of early spring or fall for best results. As a forest species, the planting soil needs to be extremely rich in organic matter, which supplies the plants high nutrient requirements and contributes to its need for drainage. Digging up an area three to four times larger than the root ball and mixing equal parts compost with the planting soil is a sure path to success with this plant. Bright shade is best and protection from the afternoon sun is critical. In hot climates, the plant tends to go fully dormant by early summer, though in very cool climates, it may persist until fall. In any week where there has not been a drenching rain, give your plant a good soaking with a hose. Maintaining a two-inch mulch of pine straw or leaves around the plants is essential to help hold in the moisture and keep the roots cool. Finally, when the leaves begin to look shabby, go ahead and cut them to the ground and let the plant lie dormant until the following spring. Powdery mildew is the most common challenge in growing bleeding heart. This fungal disease is most prolific in excessively moist places with stagnant air. Ensuring that the plants have adequate drainage, are not over watered and are not overcrowded by adjacent shrubbery that is blocking airflow are generally the best preventative measures. Directly treating this fungal pathogen is difficult at best, but the plants can live with it to some degree. It often worsens as the season progresses, so at some point, it's best to just cut the foliage to the ground rather than letting it continue to limp along. Aphids and whiteflies can also be a problem. A strong spray of water from a hose is often enough to dislodge them, though insecticidal soaps are also effective. Bleeding heart is one of those plants your grandmother probably grew that continues to light up shady garden spaces today. It is a long-lived plant if given an ideal location and regular care.